2013 Update: Since the days of Oracle7 when Oracle Corporation recommended keeping the buffer cache hit ratio above a fixed threshold, research has show some important facts. Please read: Is the Oracle buffer hit ratio a useless metric for monitoring and tuning and Optimal data buffer cache hit ratio tips. The Buffer Cache Hit Ratio Oracle metric monitors the rate at which Oracle finds the data blocks it needs in memory over the lifetime of an instance. Also see: Using the data buffer advisory utility. By itself, the buffer cache hit ratio is not very meaningful, and the data buffer cache hit ratio is largely meaningless for decision support and data warehouse applications because of their propensity to have full-table scans and parallel full-table scans (which may bypass the data buffers entirely, using PGA memory). 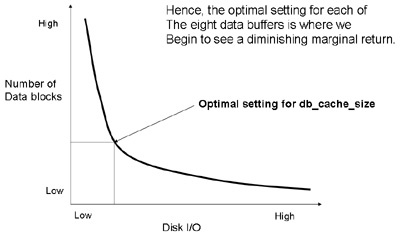 The buffer cache hit ratio is most meaningful for databases with an undersized db_cache_size, where the "working set" of frequently-referenced data has not been cached. Oracle provides the data buffer cache advisory utility (v$db_cache_advice) in the standard AWR report. (and later releases of STATSPACK reports). Oracle has expanded the advisory utilities to include a shared pool, Java and PGA advisory.